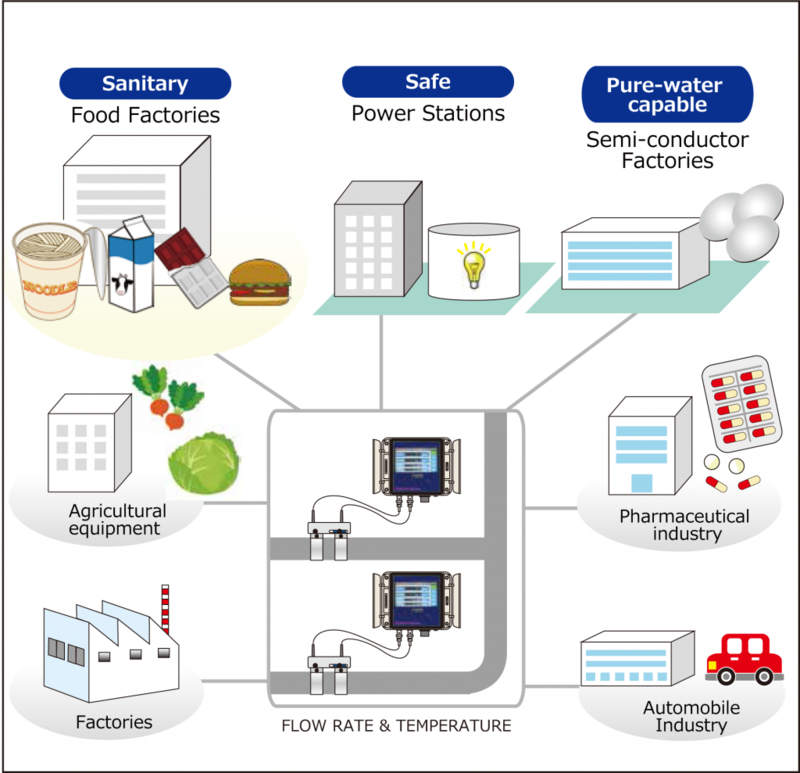 Caloriena – Monitoring systems in Various Fields | ICT. co., ltd.
Perhaps the most important characteristic of the Caloriena is how it attaches to pipelines without any holes or touching the fluid in question. This makes it the most sanitary, accurate and user-friendly ultrasonic flow meter on the market. The Caloriena can be used in any monitory system in almost any industry.We show here an example of it being used in the food industry—to monitor the amount of product (such as milk), in a power station —to monitor the heat inside of important energy plants, or in a semi-conductor factory to measure pure water. In a food industry, the role of the Caloriena is highly important since it is highly sanitary. Because the Caloriena doesnʼ t touch your food product, there are absolutely no worries of contamination. Furthermore, because the Caloriena is able to monitor the temperature of the fluid simultaneously, it is also ideal to maintain a low temperature in food products. reactions are needed. These reactions often create heat and their safe. The Caloriena can measure both flow and temperature of the reaction in question without exposing the environment and society to such dangerous chemicals. Semi-conductor factories often need to measure and use pure water, which is nearly impossible to do with an electromagnetic flow meter. However, it is not so difficult with the Caloriena, since it is capable of measuring pure water. In addition to the above qualities of the Caloriena, it is also able to measure flow rate and temperature accurately even in a curved portion of a pipe. Since most industries need to have curved, short pipes, the Caloriena is ideal for various industries.